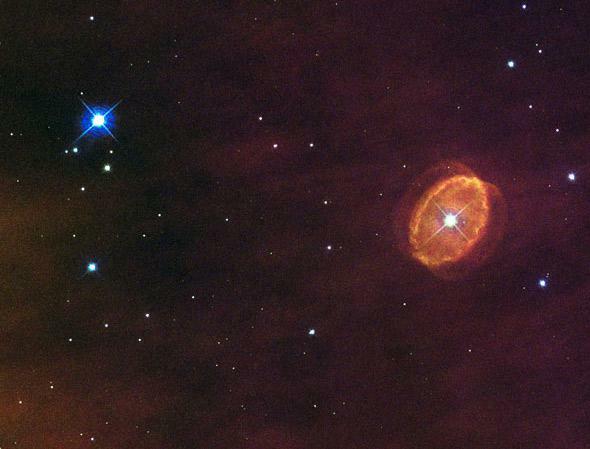 SBW1: A star on the verge of supernova. I’m sometimes asked what I think the next exploding star in our galaxy will be. Most people expect I’ll say Betelgeuse, the red supergiant marking Orion’s right shoulder. But Betelgeuse may not go supernova for another million years, which is a long, long time. There are several stars much closer to The End, and I recently learned of a new one: SBW1. SBW1 is about to make quite a splash in the galaxy. Click to chandrasekharenate. The star is a blue supergiant, a hot, energetic beast probably about 20 or so times the mass of the Sun. Stars like that don’t live long, just a few million years tops. But we know (we think) it’ll explode much sooner than that, because of that ring you see in the Hubble picture above. How does that ring tell us anything? Ah, glad you asked. SN87A also had a ring of gas around it, ejected by the star about 20,000 years before it exploded; we know the age due to how fast the gas was moving and how far it had expanded (like saying you know how long a car has been on the road by knowing its speed and distance). That means once the ring formed, Sanduleak -69 202 had just 20 millennia to live. Massive stars run through their fuel faster than less massive ones. Since we already see a ring around SBW1, that means all things being equal, it most likely has less than 20,000 years before it goes kablooie. That’s pretty soon, on a galactic scale. But are all things really equal? It’s a good question. Sometimes when you look at a star, it appears to be looking back. The pink fuzz is dust, complex carbon molecules like soot, blown out from the star, and the blue is gas. Interestingly, the gas is different than what was in SN87A’s ring: The ring around SBW1 doesn’t have nearly as much nitrogen, whereas SN87A’s had plenty. Nitrogen in the ring would come from the star when it was a red supergiant; the deficiency of nitrogen in SBW1’s ring means the star hasn’t turned into a red supergiant (yet). 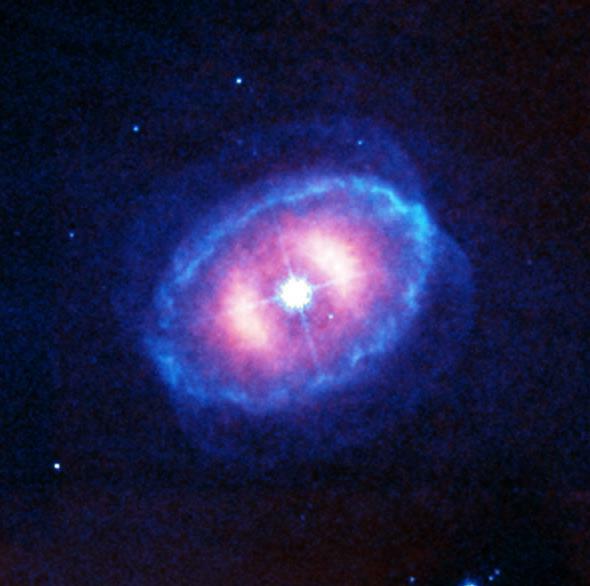 But with SN87A, we think it had to have been red before it exploded; its ring was likely the result of winds of gas blown out from the star when it was red getting blasted from the dins blown out later when it was blue (the reasons for this are subtle, and I’ve explained them before if you’re interested in details). If SBW1 has not been red, then there must be some other reason it has a ring. This is the part I love about all this. 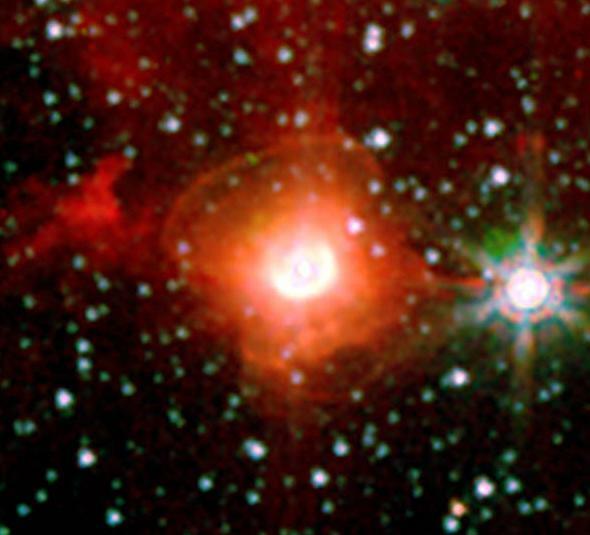 Smith and his co-authors have an idea for what formed SBW1’s ring: It ate a companion star. It used to be two stars, a massive one and a smaller one. As the massive one expanded, it would have engulfed the smaller one. The smaller one would’ve been orbiting it rapidly, so when it got engulfed it would’ve spun up the big one like a whisk stirring a bowl of eggs. When this happened, the star ejected a huge amount of gas and dust in a single eruptive event. Because the star was spinning rapidly, this material would have been blown out preferentially in the plane of the star’s equator. All that junk flew away from the star where it expanded and cooled, forming a clumpy ring. The tremendous energy of the light coming from the central blue supergiant star lit it up, which is why we see it in the Hubble images. Now we don’t know this for sure, but it fits the data. It’s different than what’s proposed for the formation of SN87A’s ring, which was winds from the star interacting over thousands of years. So the two rings may be very different, but we don’t know. It’s possible they both formed the same way. They are both about the same size and mass, though, which means they’re similar in some regards. So maybe SBW1 is on the same timeline that Sanduleak -69 202 was before it went off. That puts 20,000 years tops on SNW1’s clock. But again, we’re not sure; it may be longer. I’ll note that two other stars, Sher 25 and HD 168625 (pictured below, also c/o Smith), are also blue supergiants with rings, and both are more massive and hotter than SN87A (before it blew) and SBW1. Either one of them might go first. We just don’t know. As you can see, this gets a bit confusing. It gets weirder, too: We think, on average, a star should blow up once per century in a galaxy our size, but it’s been many centuries since the last supernova in the Milky Way (SN87A was in a companion galaxy to us). That’s a statistical average, so it’s not like we’re overdue. But it tells you that there are probably lots of stars that might explode before any of those four (well, three, since 87A already exploded). Or it may very well be one of these guys. I’ll note that all of them are too far away to hurt us when they explode; they’re thousands of light years away, and a supernova has to be less than 100 to hurt us significantly. So we’re safe. The good news is that SN87A was 170,000 light years away when it exploded and we learned a huge amount about how massive stars end their lives (answer: not well). SBW1 is about 20,000 light years away, so we’ll have a much better view. It seems weird to say, but I rather hope it blows up soon. It’s in the constellation of Carina, which isn’t visible from where I live, but still, the pictures would be spectacular, and the science would be fantastic. The heavy elements in the Universe were literally created in such explosions; the calcium in your bones and the iron in your blood were forged in the hearts of supernovae. Without such destruction there would be no creation. In that sense, studying exploding stars is just another way of studying ourselves. We are literally a part of the Universe, and the Universe is in us. It’s funny to think that looking outward helps us see inward, but astronomy is full of delightful ironies like that.